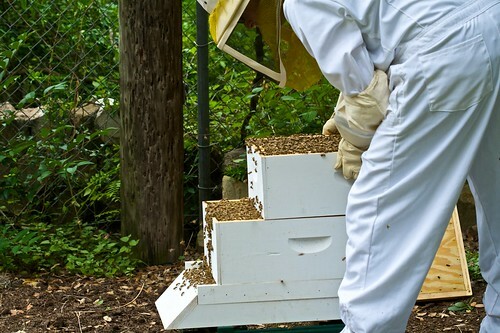 Week 9 Inspection – Seriously Covered in Bees! Last week I added a 4th super because Large Marge and the girls definitely needed more space. Unfortunately, when I opened up the hive this morning, there were zero bees in the 4th super. I think this was due to both the queen excluder in between the 3rd and 4th super, and the fact that the 4th super had brand new undrawn frames. I put the excluder on when I added the 3rd super three weeks ago which in theory was suppose to get the girls used to going through it, but that theory is busted. 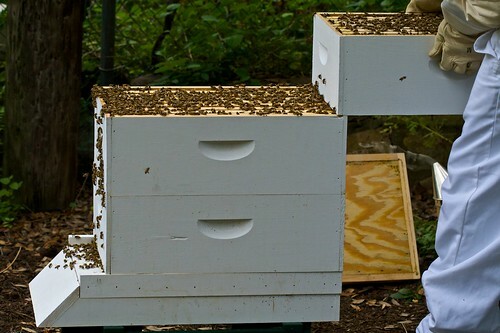 Below you can see me putting the hive back together and the girls are busting out at the seams. I was worried that this overcrowding would initiate a bunch of queen cells for a swarm, but I didn’t see any during my inspection. The 3rd super was almost all honey, and the other two were almost all brood. The bees were also a lot more feisty this morning probably due to all the honey in that 3rd super. Adding the 3rd super back on the hive. I removed the queen excluder and put the 4th super back on. Once they get comb drawn out, I can add it back on as long as I make sure Large Marge is in the 3rd super or below. Make sure your spectators don’t wear black so they look like bears. No one got stung, but there were a lot of close flybys and some chasing involved. My wife (for once) didn’t wear black this time and she was fine. Only use the queen excluder if you have drawn out frames or you at least put one frame with honey in that super to entice the bees up. Find exercises for low back strength. That 3rd super full of honey must have weighed 40 to 50 pounds. I’m so glad I decided to go with medium supers for my entire hive. I can’t even imagine lifting a full deep brood box without some sort of system of levers and pulleys.